Rate this Article The DC Universe is simply filled with a fantastic line-up of some of the best superheroes there is, and if you're a fan of these superheroes, you might want to check out these amazing games! Whether you look up to that really buff man with laser eyes from the planet Krypton, the guy with a gruff voice and a tragic backstory who happens to live in a reeeaaaally rough neighborhood (Gotham is seriously insane!) or even the fastest man alive, we all got to admit – the DC Universe is simply filled with a fantastic line-up of some of the best superheroes there is! Of course, most fans would probably be thinking... Why read all about the various superheroes of the DC Universe when you can actually play as a budding superhero in that exact universe? Introducing this amazing MMORPG, DC Universe Online! Create your superhero with one of the most elaborate character creation system whereby you can not only change your hero’s looks, superpowers and race, but also his/her fighting and movement styles, mentors and the inclination to either good or evil. In this game, you’ll get to dive into a world where almost all DC superheroes have been defeated by the supervillain, Brainiac, and in a last-ditch attempt, Lex Luthor has used nanobots to grant every person on the planet superpowers in hopes to take down Brainiac’s forces. With a gigantic world to explore, villains to fight, stories to uncover and superheroes to team up with, DC Universe Online is as close as you’d get if you fancy being a superhero and saving the world. If you enjoy the thrill of risk-taking (and of winning) that comes with gambling, you might want to check out some of these classic online slots: “Batman & Catwoman Cash” and “Batman: The Joker and Jewels”. In these games, if you get the Bonus symbol on reels 1, 3 and 5, you’ll earn some free games that will allow you to not only win some additional cash, but also incredible stacks of multipliers which will greatly multiply your overall wins. 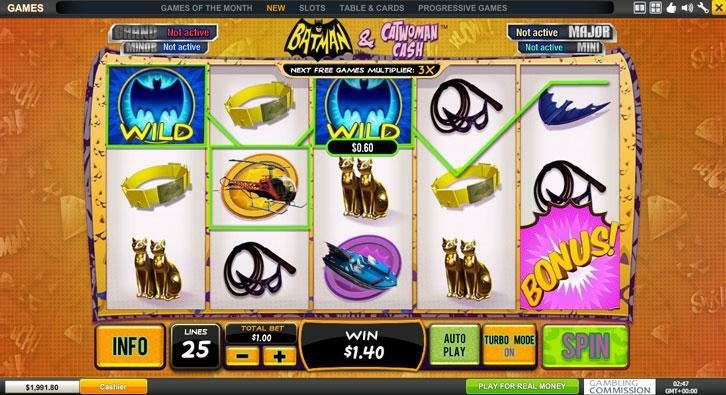 There are also special bonuses in Batman & Catwoman Cash, which may come in the form of a nice cash prize, increased win multipliers or both, if you managed to land the reels on the required symbols. In the case of the game, Batman: The Joker and Jewels, it offers random Wilds instead, giving you the chance of getting up to 9 Smile Wild symbols in any position on any spin. By playing these slot games, you’ll also have a chance to win the mystery progressive jackpots at DC Super Heroes Jackpot with wins that can reach up to more than a million in cash! After a dose of slots, we’ve got another DC-themed MMO game for you – DC Legends. Available only on mobile devices, the game allows you to build up your own ideal team of superheroes as well as unlikely supervillain allies, and fight against one of the most powerful supervillain in the DC Universe and his army of the undead, Nekron. Compete with other players to hone your strategic mind, turn your heroes into legendaries and enjoy the game’s brilliant cinematic action and breathtaking environments. We’ve compiled some of the most entertaining online games in the DC Universe, saving you all the hassle of finding a suitable game in the vast realm of the internet. So, don’t stand at the sidelines! Immerse yourself in these amazing DC games now and well, you can thank us later!